The Northern Privet plant is the most commonly known as the privet hedge, is native in Japan and Korea but is now found in most of the Earth's temperate zones. The privet is a deciduous shrub most commonly cultivated for the creation of a garden wall, or hedge. It is perhaps with the UK, where this is the most comment species of a hedge that most people associate this dense, rapidly-growing plant. Privet hedges can grow up to 15 feet in height, with a similar width. The shrub's white flowers, famed or reviled for their pungent smell, generally bloom in mid-summer, followed by small black or purple fruits. No garden is complete without these ornamental shrubs. The northern privet plants are great to create a unique border. These look great on a lawn, sidewalks and also a long driveway. These shrubs are very strong and hardy. These shrubs adapt to all kinds of soil conditions. Northern Privet Hedge is the most popular when it comes to privacy hedges. As one might gather from its name, Ligustrum is a native plant. It has become popular in the United States due to several notable characteristics. Growing up to 18 feet tall if allowed, its glossy green evergreen leaves and thick cover respond exceptionally well to pruning and shaping. It is a favorite ornamental shrub or tree depending on size, where it can be formed into shapes such as pyramids or globes. Using pots to limit the scope, they can be given even more complex ways or moved as needed for decor. Further, it has a fast rate of growth and is quite hardy, able to thrive in many soil types and full sun or partial shade. Panicles of white flowers will bloom through the spring, giving way to bold black drupes of fruit in the summer which can continue through fall and into winter. 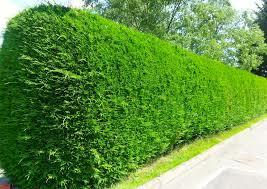 Northern Privet Hedges can be left untrimmed or trimmed for a clean look.